Anchor�s PipeTorq inserts range of hexagonal grooved metal inserts tapped through with BSP, G, NPT, and NPS pipe threads. PipeTorq inserts are specified with generous hex sizes and deep grooves to cope with high torque levels during assembly and use. 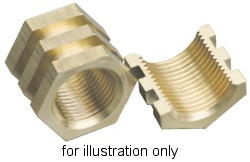 PipeTorq brass threaded inserts are idealy suited to moulded diesel and water tanks. It is worth noting the British Standard Pipe (BSP) thread is identified as the Gas (G) thread in much of Europe. Pipetorqs are available as standard in brass with an extended range including stainless steel variants, non standard lengths, and oversize inserts for more demanding applications. All dimensions in mm, L is insert overall length and A is hexagon or square across flats.